January 29, 2014 | Lens cap....off! I was up early this morning and had the opportunity to break out my camera. My goal was to get some pictures in using the morning light. It’s hard to tell which I like best…the light of the new day or the dwindling light that fades into night. One thing that I’m finding as I’ve been using my camera is that I love natural light. I’ve not had much success using the flash on my camera–and that could totally be as a result of inexperience. But I’m really enjoying using and abusing the natural light around me. So then there’s this picture. 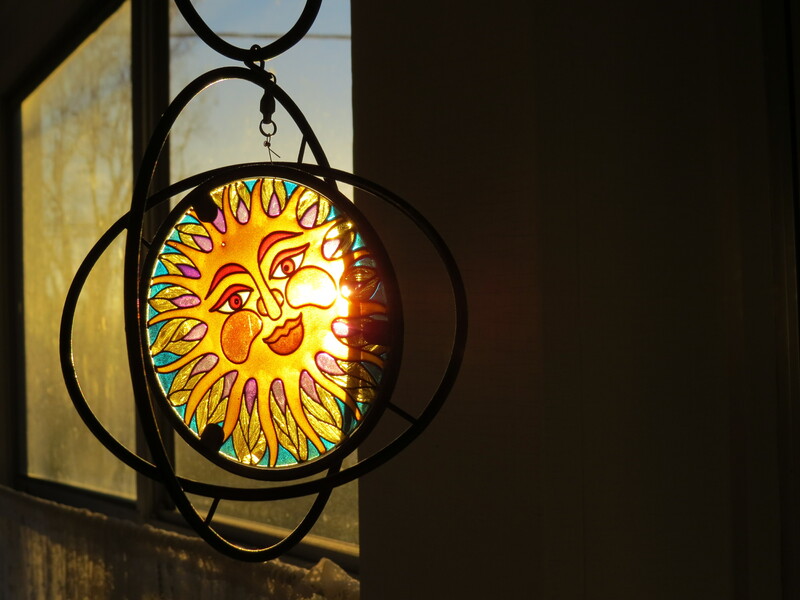 I love the way the light is playing on the glass…and of course that it’s a blazing sun in the piece. Ignore the fact that my porch windows need a good scrub. Window washing, ugh. Only a couple of days until the weekend. I’m ready to mix it up a bit. Pingback: February 6, 2014 | Lens cap....off!